On Wednesday, April 2nd, Movies at Mothers returns when we present Jacques Tati’s brilliant 1967 send up of modernity and the new Europe, Playtime, starring Tati himself as the one and only Monsieur Hulot. Here is where I would normally layout the basics of a film’s plot, but to do so with virtually any of Jacques Tati’s films seems a fool’s errand and ultimately misses the point. His films are ballets of gesture and observation. They are intricate musee mecaniques, with each cog and gear engaging the next one until his grand glockenspiel winds up for a head spinning crescendo. They are a series of sub-plots, vignettes and side glances, but story in the traditional sense of the word is largely irrelevant. 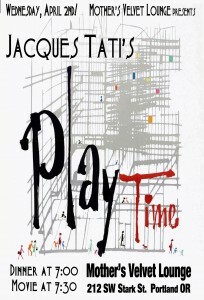 Playtime is Tati’s take on mid-century modernity with some affectionate jabs at the Americanization of post war Europe. In 1967 it was the most expensive film ever made in France and was released a full 9 years after his previous hit, Mon Oncle (1958). On the outskirts of Paris he constructed the entire city you see in the film, which is occupied by Mies Van Der Rohe inspired blocks of steel and glass. It is the vision Le Corbusier had for Paris in the 1920s when he proposed that the fabled city be leveled to make way for such architecture. Occasionally one of the characters will open a glass door or stop at a window to catch a glimpsed reflection of the Eiffel Tower or the Arc De Triomphe, but beyond that, the only thing left of Paris are the Parisians. But the film is first and foremost a comedy, and the more attention paid to it’s details the funnier it seems. There is virtually no dialogue, and the French and English verbalization at hand is so easily understood that the film was released in all markets without subtitles. The humor is mostly visual so we are presented with a 1960’s silent comedy in the tradition of Keaton and Chaplin, though keep in mind his sound design is intricate and often serves as the biggest part of the “joke”. At the same time Tati steers clear of full-on slapstick. His sense of humor is that of the everyday, the routine and mundane, and absent of even an ounce of cruelty. 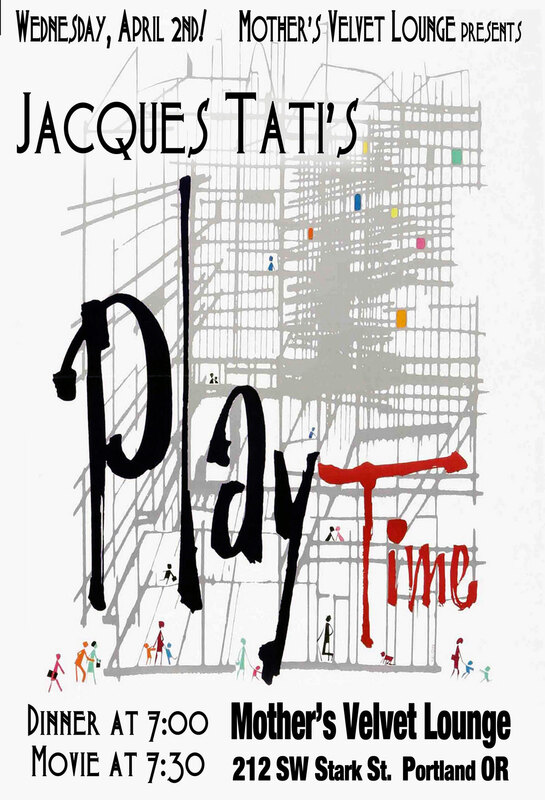 It is the rituals of modern life that we unconsciously perform on a daily basis that is the source of his comedy.Playtime provides an opportunity for us to laugh at ourselves, and to come away with some poignant understanding of the absurdity inherent in society’s quest for order.